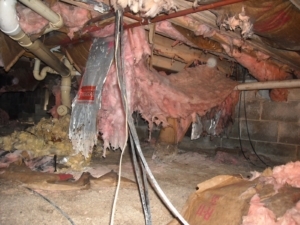 Traditional paper-backed fiberglass insulation in the crawl space can support mold growth, serve as a food source for pests, and is poorly suited for humid environments. Crawl Space insulation of this nature tends to sag and fall due to the added weight from moisture, old age, and the vibration of occupants walking on the floor above. The insulation eventually starts to drop from between the floor joists losing its effectiveness to maintain the home’s thermal envelope. Also, high humidity environments need a non-vapor barrier product allowing any air-born moisture to dissipate, rather than become trapped between the poly and the sub floor. This is the beauty of the T•A•P® Crawlspace Insulation System featuring ComfortTherm® poly-encapsulated fiberglass. Complimenting the TAP Attic Capping Program is the TAP Crawlspace Insulation System featuring ComfortTherm poly-encapsulated fiberglass batts. It’s the ideal product to rid a home of cold floors, reduce sound infiltration, and decrease your customer’s energy costs. Installed in the home’s crawl space, ComfortTherm makes your floors warmer while reducing sound infiltration, improving the quality of air in the home, lowering annual heating bills during the winter and cooling bills in the summer. ComfortTherm adds to the overall value and comfort level of the home. ComfortTherm batts cut easily with an ordinary utility knife and are sized to fit standard cavities. The batts are placed between joists and secured with wire hangers (tiger teeth) pressed between the floor joists and against the insulation. Once installed, ComfortTherm should be in contact with the sub floor, leaving no gaps. The plastic facing of standard ComfortTherm is a vapor retarder, and in colder climates, is placed toward the heated or conditioned side of the floor. In predominantly hot, humid climates, many codes make vapor-retarder use optional. ComfortTherm with a non-vapor-retarder facing is available for these areas. See our ComfortTherm product flyer. 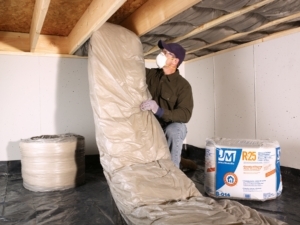 ComfortTherm Insulation is available in R-19 and R-30 nationwide and comes in batts depending on R-value. It is compression-packed in plastic bags for savings in storage and freight costs. Available in single batts, palletized (1 pallet covers approximately 1,743 sq. ft.), or LTL quantities . Contact us today and allow us to show you why the TAP Crawl Space Insulation program featuring ComfortTherm poly-encapsulated fiberglass insulation is the smart and savvy addition to your current service offerings! Note: ComfortTherm® Crawl Space Insulation is not an EPA-registered pesticide and should not be sold to treat or control pests.